Now there’s even more scientific proof that you are not a Neandertal, no matter what anyone says. An international consortium of researchers reports in the Aug. 8 Cell that for the first time the complete sequence of mitochondrial DNA from a Neandertal has been deciphered. Comparison of the Neandertal sequence with mitochondrial sequences from modern humans confirms that the two groups belong to different branches of humankind’s family tree, diverging 660,000 years ago. That date is not statistically different from previous estimates of the split between humans and Neandertals, says Erik Trinkaus, a paleoanthropologist at Washington University in St. Louis. The sequence also doesn’t reveal what happened to drive Neandertals to extinction, but it does clear up some discrepancies in earlier studies. “It’s a major tidying-up of a lot of loose ends,” Trinkaus says. At 16,565 bases long, the new sequence is the largest stretch of Neandertal DNA ever examined. The DNA was isolated from a 38,000-year-old bone found in a cave in Croatia. 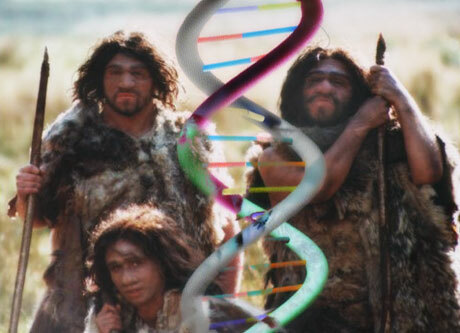 In order to know exactly how modern humans and Neandertals differ, scientists will need to examine DNA from the Neandertal’s entire genome. The sequence reported in the new study was generated as part of a project to decode Neandertal DNA, but it contains information only about DNA from mitochondria. Mitochondria are organelles that generate energy for a cell. Inside each mitochondrion is a circular piece of DNA that contains genes encoding some of the key proteins responsible for power generation. Mitochondria are passed down from mothers to their children. Scientists use variations in mitochondrial DNA as a molecular clock to tell how fast species are evolving. Scientists have previously examined a short piece of Neandertal mitochondrial DNA known as the hypervariable region, but this new complete sequence helps clear up some ambiguities from studies comparing Neandertals and humans, says John Hawks, a biological anthropologist from the University of Wisconsin–Madison. Some modern humans have several changes in the hypervariable region that made it seem as if Neandertals are more closely related to modern humans than humans are to each other. Human and Neandertal mitochondrial DNAs differ at 206 positions out of the 16,565 examined, while modern humans differ at only about 100 positions when compared with each other. The mitochondrial genome contains 13 genes, blueprints for stringing amino acids together to make proteins. The researchers examined the nature of changes within those genes to learn how proteins evolve. Generally, changes that alter the amino acid sequence of a protein are bad because they disrupt the way a protein works or interacts with other proteins, says Richard Green, a computational biologist at the Max Planck Institute for Evolutionary Anthropology in Leipzig, Germany. Neandertals have more amino-acid altering changes in their mitochondrial genes than do other primates, Green and his colleagues found. “This really demands an explanation,” Green says. One scenario that could explain the finding is that Neandertals had very small effective populations long before they went extinct.